Currently exhausted and enfeebled. I think Bullygate has finally taken it's toll. Going to resort to lolling on the new sofa watching crap Cagney and Lacey style telly. No doubt I'll be back to my normal cutting self soon. Bye all. x PS: I meant cutting in the acidic humour way not in the self-harm sense just in case anyone was wondering! Get your money's worth out of that sofa rochemere. You deserve it. "hallo darlin' put your knickers on and make us a cup of tea will ya I'm parched". Actually I think I made that up but that sort of thing anyway. Annie - thank you - it's the Lady of Shallot. My mum used to read the poem to me as a child. You don't really need to wish me well - I think I'm just tired and moany and feeling a bit crosspatch. That last week of bullygate really finished me off - unusual for me I must say. 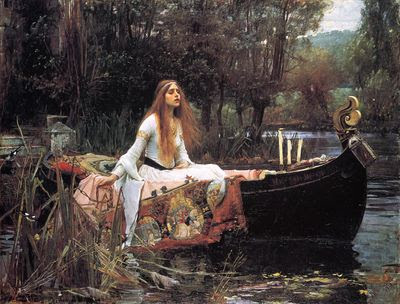 I put the picture up as it depicts exactly what I feel like doing at the moment - drifting downstream in a boat with just the sound of flies buzzing idly and the soft wind wafting through my hair and an empty head of lazy thoughts. oooh - have you got dvds of cagney'n'lacey? shove up, rocky, make room for another mad mutha. i'll bring the popcorn. oh - didn't you used to snigger at that bit, 'the curse has come upon me! cried the lady of shallot'? Mother of Madness - yes - the Lady of Shallot - always appealed to my slightly ever-so over-dramatic side. Troubled diva' red nose thing? Don't know about that - I better go and google it! Cheeky Pod - what? that I like crap telly? Actually - I was most upset to see Cagney and Lacey wasn't on! That's why I watched the Sweeney - completely at the other end of the scale. From lesbo heroine cop icons to macho sexist hard-drinking cops. Splendid. Take care and rest well. What a nightmare week. yes, i can do that. native americans have these powers. Mad Muthas - god - I've never really thought of myself as funny - perhaps I'll send them the drunken post although that was just palin embarrassing! Thanks for the link. Arabella - Tirra Lirra good lady and fare thee morrow or something like that? haven't heard tirra lirra for years! Krusty - would that be onion gravy Wavy? But the worst of it is all over, now that solicitor dad has woken up this morning with his daughter's pony's severed head on his pillow. Lawyers are wankers aren't they? Ister - oh - I wondered why they looked so pale this morning? Yes - I guess the worst of it is over although I haven't heard the final word yet. Quite frankly - a bloody apology form the mad parents would be nice. Instead the mother seems to be carrying on as normal and saying 'hi' to me all the time. I can't stand it. If I was rich and bored enough I would sue him for harrassment, defamation of character and coercion. I found out he isn't a lawyer but a banker (ooh? what rhymes with that?) or an accuntant of some sorts! And yes - I meant to leave out the o. We Are Off To See The Wizaaaard!